You will need to have read book one, Honest Love, before picking up Bitter Truth as it does follow on where Honest Love finished. 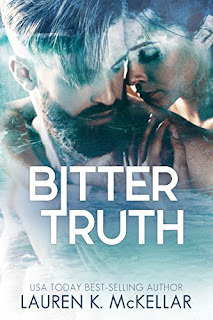 I have been impatiently waiting for Bitter Truth since I finished reading Honest Love a few weeks ago, and Ms McKellar has not disappointed with the conclusion of the duet. My heart was breaking at the end of Honest Love, and it didn't heal until the end of Bitter Truth. I really enjoyed getting the first part of the story from Everly's POV. It shows us just how much others suffer after tragic events, even if they aren't directly involved. You never know what someone is going through behind their smiles. Cameron - sigh. I adored him in Honest Love, but I down right freaking love him in Honest Love. The love for his little girl (or is she? ), the love for his wife who has passed, the love he has for Everly (even though he isn't sure he wants to). So much love, so much pain. I don't want to give anything away with this duet, as I truly feel that going in a (little) blind makes for an even more amazing reading experience. I loved it, I hated people, I wanted to slam some people with my kindle! I ran the whole gamut of emotions as I devoured this story. I am still in recovery mode, and am now eager for what Ms McKellar brings us next.